Two Bears Farm and the Three Cubs: Happy Birthday Cort and Reid! Happy Birthday Cort and Reid! The twins are turning 3 today. THREE. How did this happen? Seems like just yesterday they were infants. We had some family over this past weekend to celebrate. The twins had been going on and on about how they wanted boat cake. No clue where they got that idea. You may remember I posted last year that the store bought cakes had gotten so expensive that I planned to start making my own. Well I drove all over town to find two plastic boats and took the easy way out on "boat cake". I made my grandmother's recipe for Indiana Chocolate cake and turned the cream cheese frosting blue. I was scared the twins would be disappointed, but they were delighted. We did candles on individual pieces of cake again. The twins had just had a cold, so we didn't want to spread germs. Afterwards, there was the added bonus of licking cream cheese frosting off the bottom of the boats. 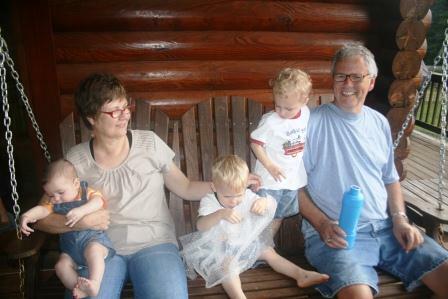 A little time on the porch swing blowing bubbles and hanging out with the grandparents. The baby my mom has is Dean, the newest cousin! 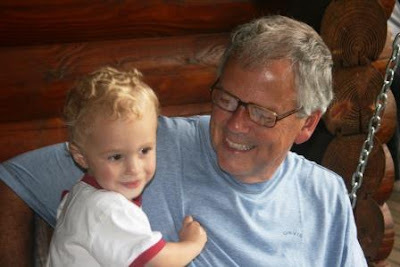 Cort hangs out with his special buddy, Pop Pop, who made Cort potato salad special, because it is one of Cort's favorite things. And Pop Pop does make the best potato salad for the past 20+ years - if you remember Justin Wilson it is one of his recipes. For their birthday, the twins got to break out of their cribs! We went straight from cribs to big boy beds. 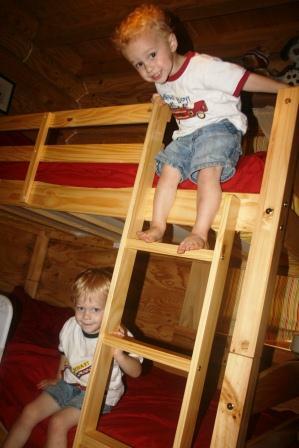 They are delighted with their new bunk bed. So far so good, although I have had to separate them at times for nap. Cort climbs down and gets into bed with Reid. So I have started putting him in Pierce's room to nap. They do well at night at least. So happy 3 years to Cort and Reid! If you missed their original birth story, you can find it here. These two bring me so much joy. They are just growing up too fast! Special thanks to those who visited and/or sent wonderful gifts for the twins' birthday! We are thankful for all you do for them. Happy Birthday to two delightful boys. Yay for big boy beds! Love the pictures! Can't believe those little boys are so big already :-) I think it is sweet that they want to sleep in the same bed. Happy Birthday Cort and Reid I love your new big boy beds very cool. Wow, hard to believe they are 3! Happy birthday to them both! Happy Birthday, Boys!.... what very cool beds you have! 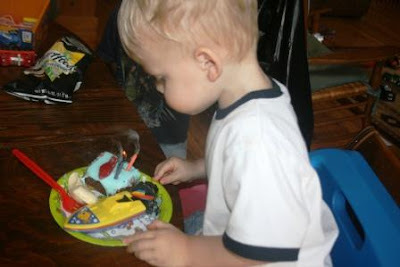 ..and the cake was adorable, great idea! Happy birthday boys! !!! Love the cake! Happy Birthday Guys! I love the boat cake. Licking frosting of a boat has to be wonderful! Happy birthday boys! 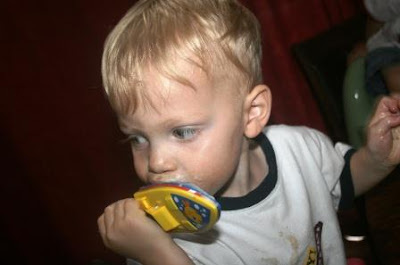 The time dose fly when they are little. It looks like they had a terrific day! Oh Happy Birthday to Cort and Reid. They are so cute. Don't 3 years go by in a hurry?? Happy Birthday to them!!! I love their names. The photos with them on their beds are so cute! happy birthday, sweet boys! i like those bunk beds! glad the boat cake was a hit, too! happy birthday twinners...cort and reid. Very happy for parents and gp's too. Cute. Happy birthday to these big boys and their big beds! Those are some pretty cool beds! Happy birthday Cort & Reid! 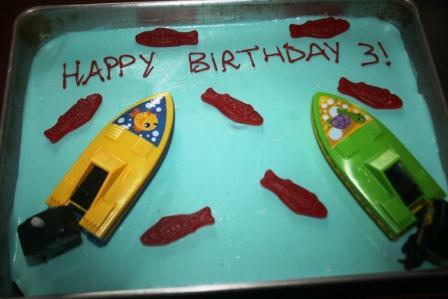 Your boat birthday cake is awesome! Happy Birthday to your precious twins. I love these photos. You are certainly blessed! What a great idea with the boat cake. Happy B Day boys, what a delight to share the fun. Looks like a fun celebration and the cake is so cute. 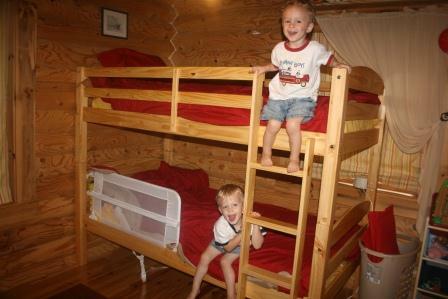 Hope they enjoy their new bunk beds. I will have to come back and read their birth story. Happy Birthday Cort and Reid!!!! Happy Third Birthday, Cort and Reid! Looks like you two had a fantastic birthday! I love the bunkbeds! They are so dang cute. I am dense or slow, but I didn't know they were twins til now, please excuse my dumness. So you like caramel on ice cream huh? Is that what that picture is? hmmmm? Oh My... they grow up so fast don't they. Cool Beds!! Happy birthday boys! Love your cake and your big boy beds! beautiful cake, i'll bet it was delish!! Such sweet boys--happy birthday to them! I love the cake--it really looks like water with boats on it! Happy Birthday to the two cutie pies- they are growing up so fast! The cake is adorable; you did real good, girl. Happy Birthday to the sweet twins. Time is flying by for all of us! Enjoyed the pics!! Happy Birthday to a couple of cute boys! The cake is really cute too. Happy birthday to your boys! Looks like a fun, wonderful family. And congrats on the cake, it looks delicious! Happy birthday to your little cutie patooties!! We love your big boy beds! Happy birthday to your sweet boys! They do grow up fast! Happy Birthday to Cort and Reid!!!! Cannot believe we have been following them for almost 3 years now!!!! It's been fun! And they are just adorable!!! Happy birthday to Cort and Reid! How exciting to have a boat cake, time with grandparents AND big boy bunk beds!! I always made the birthday cakes for my children too. Sometimes I didn't quite think it through enough... like the time I made icecream cake and forgot to put it in a pan that was small enough to fit into my side by side freezer. As you can imagine, I wasn't nominated for the " mother of the year" award that year....either. Aww, Happy Belated Birthday to the Twins!! I think your cake turned out beautiful!! Love the cake!! And the bunkbeds. They are so cute Lisa. Happy birthday to your babies! !